Been a busy week catching up with sample work after our mini break. 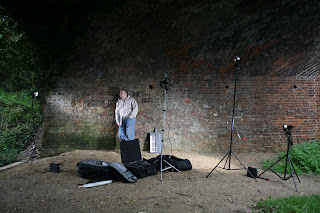 Set of DnB samples done for the next issue of FM plus it's our turn for the photo shoot. So it's off outside with a laptop, sh101 and our mucka and fab lens-smith Ecki. 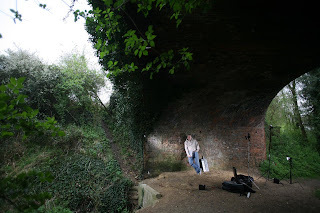 Disused railway bridge not far from GCHQ looked grimey enough for an atmos shot, so up went the lights and Mr Hoodee begins to look uncomfortable !-) The shot above and below show the set up for the shoot, will post the actual photo used when we know which one FM used. Anyway samples done and turned in, so we thought it'd been a while since we got anything for the studio so we've ordered one of these little beauties from Chimera Synths (also based in East Anglia) - couple of weeks waiting list but we'll shove up a video as soon as we get it. That is such a weird coincidence, you picked the very spot I used to use for pee break on my bike ride to work. Spooky.